Quilters sometimes tend to toss quilt blocks into their scrap bins if they think the blocks aren't absolutely perfect. And yes, maybe some of those blocks should be placed aside and regarded as learning experiences. But before you decide that quilt blocks won't work, try a few easy methods to square them up. Is the Quilt Block Too Small? If pressing the block again doesn't work, or if the patches on the outer edges of the block are a bit skewed or uneven, use freezer paper to prep the block for sewing. 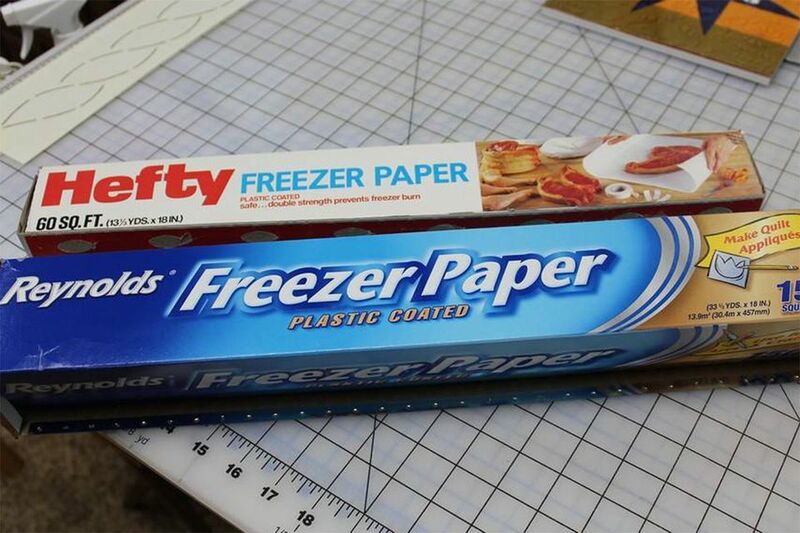 Gridded freezer paper makes the job easier, but you can work with plain freezer paper if that's what you have on hand. Cut a piece of freezer paper the exact size your unfinished quilt block should be. Draw two straight lines on the freezer paper's unshiny side -- one along the vertical center and one along the horizontal center. Draw two diagonal lines, each from one corner to the opposite corner. Draw other lines you feel will help you position the block on the freezer paper, including the outer 1/4" if you're not using gridded paper. Place the block on an ironing board, right side down Position the freezer paper on top of the block, shiny (unmarked) side down. Align the quilt block with the freezer paper image, matching up strategic parts of the block with the drawing. Use short applique pins to stab through areas to keep the two from shifting apart; regular straight pins are fine, but you won't be able to press as easily without removing them. When the block and the drawn image are aligned as closely as possible, press the paper onto the block. Remove the pins. Inspect the edges of the block. They probably won't all reach the edges of the freezer paper, but they should extend well enough into the outer quarter-inch area to catch the seam as it is sewn. Repeat for all blocks that need to be squared up. To sew blocks together, align the edges blocks pressed to freezer paper and check to make sure the patches are matched under the paper. Secure with straight pins to keep blocks from shifting. Sew a seam 1/4" inward from the edge of the paper. Assemble into rows then join rows. Do not remove papers until all adjoining blocks are sewn together. Leave the papers around the outer perimeter of the quilt until the quilt's borders are added. Remove them now if you plan to make a quilt sandwich without adding borders. This method helps prevent skewed quilts by keeping the blocks aligned correctly while you work. The seams will be where they should be, and that's often very different than where they would be if you match the edges of inaccurate blocks. Many quilters participate in quilt block exchanges. Part of the fun of quilting exchanges is sharing work with friends, and while most quilters try to make sure their work is accurate, there are often variations in blocks. Maybe the quilter used a slightly different quarter inch seam. Or maybe the patches were cut using different brands of rotary rulers or by positioning the fabric in a slightly different spot under the ruler. Slight differences can be corrected by one of the techniques explained above. If you expect perfection in every quilt block you receive, it may be best not to join a quilt exchange, or to exchange quilt blocks with a limited number of quilters who you know will send you perfectly stitched blocks. But if you're looking for friends and memories, block swaps are a wonderful way to meet quilters from around the world.